← FlixChip: USB Drives Now with Movies! LaCie has recently released two storage drives under its Rugged USB 3.0 Thunderbolt series. The drives, a 1 TB HDD and a 120 GB SSD, are first storage devices in the market that feature both Thunderbolt and USB 3.0 technology. 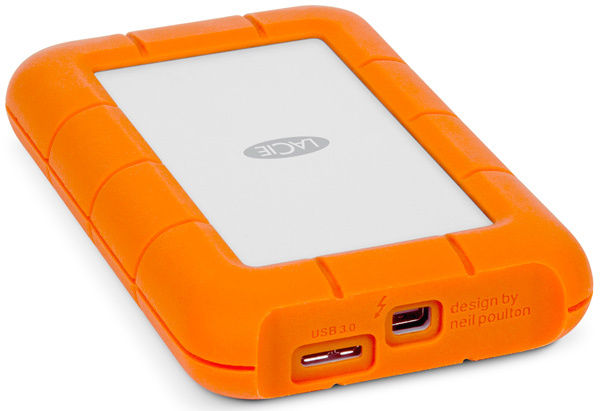 As a result, the LaCie Rugged possesses two of the fastest bus-powered storage devices in the market today. Equipped with both USB 3.0 and Thunderbolt, the LaCie Rugged series guarantees that users can experience surges in transfer speeds whether using a PC or Mac device. At LaCie lab tests, the SSD version broke records by offering speeds reaching up to 380 MB/s, which is allegedly the fastest transfer speed recorded in a bus-powered device. The HDD version still does a respectable job of keeping with speed performance; it clocked up a rate that maxed out at 110 MB/s, a speed 35% better than the connection rate possible with FireWire 800. In terms of speed performance, the bottom line is that LaCie’s Rugged USB 3.0 Thunderbolt Series are fast; the SSD, for example, is capable of moving 10 GB’s worth of files in just a few seconds and guarantees no lag when it comes time to access the files stored in it. The main selling point of the Rugged series, the dual technology connection interface, is its strong suit. Being compatible with two bus interfaces gives the series a very varied choice of compatible platforms to work on. Whatever computer you may have on hand will likely be able to read and run the drives. That means Thunderbolt for any Mac with a port for the interface and USB 3.0 for any computer with USB 2.0 or 3.0 ports. Unless you’ve resurrected computers from the graveyards of USB 1.1 and comparable, compatibility issues are at a minimum. The “rugged” portion of the series comes into play with the MIL specs that the drives adhere to. The drives can survive a 4-foot drop with the data inside it intact. And if you’ve opted for the SSD, expect a fair amount of resistance to vibration and shock. For security purposes, AES 256-bit encryption has been included. The LaCie Rugged drive series is available through Apple Retail, LaCie’s online store, and LaCie resellers. Base prices begin at $199.99. This entry was posted in LaCie USB 3.0 Hard Drives, USB 3.0 Hard Drives and tagged LaCie, Rugged Hard Drive, Thunderbolt, USB 3.0 Hard Drive. Bookmark the permalink.